As chronicled in this post last August, The PRDude likes food. Well, really, who doesn’t? And, for a while in the late 1980s, I held the position of vice president for a boutique Chicago public relations firm that specialized in restaurants. (As you could imagine, there were great fringe benefits: Lots of great lunches and dinners cooked by leading chefs.) I managed campaigns designed to build awareness for new restaurants and campaigns designed to drive patrons to revisit existing restaurants. This was an era when the term “celebrity chef” was still not quite part of our lexicon or popular culture. What’s more, the phrase “foodie” was still not coined. Today, of course, a growing segment of the population is obsessed with all things food, a development that launched an entire TV network devoted to food, competitive food programs and the rise of the so-called celebrity chef. There even are programs where the host eats bugs and other odd stuff and one where a man “challenges” food — to see if he could consume more than should be humanly possible in a single sitting. Let’s recognize that the networks air programs where — gasp! — a chef gives instructions on how to cook. You know, a show that offers recipes, technique and insight on ingredients and nutrition. A few decades back, there were programs like this, and they featured passionate cooks who taught you how to prepare and love food, but without the preponderance of F-bombs, kitchen tantrums and shoulder-to-wrist tattoos. Both men have passed on to that Big Kitchen in the Sky. Both, I think, would have hung up their aprons after watching some of the potty-mouthed, tough guy, renegade prince and princesses that populate “Top Chef,” “Hell’s Kitchen” and some of the other popular programs aired today. Smith, a cordial, bespectacled ordained minister, had a gentle way of educating the viewer on how to prepare simple dishes made in his TV kitchen at WTTW studios in Chicago. His mantra: “Frugal does not mean cheap. It means you use everything.” Watch this video on his recipe for preparing peas and egg soup to get an idea of what the Frug was all about. 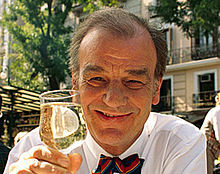 Keith Floyd, Floyd on Food. From the opposite end of the menu we have Floyd, a brash Englishman who cooked in kitchens in Briton and on the continent, as well as on the galley of a fishing boat. Floyd’s mantra: “Let’s let that cook while I take time for a little slurp,” a reference to his practice of cooking with a nice glass of red wine nearby. Here, Floyd offers some thoughts on cooking meat. Both men were entertaining, informative and captivating. I learned how to cook and cultivated a liking for different kinds of food by watching their programs. With many of today’s food-related shows, I only learn that chefs like to swear a lot. This Thursday, those of us who are fortunate will join family and friends for Thanksgiving, a true American holiday, one dominated by food. I’ll join family for what I’m sure will be a wonderful afternoon of conversation, wine, and of course — food. I plan to make soup from the turkey carcass, as I have the past several years. Rest assured: I’d rather have Jeff Smith or Keith Floyd in the kitchen next to me than any of the “celebrities” who call themselves chefs today. Swearing is not an ingredient that adds much to the flavor of your dish. 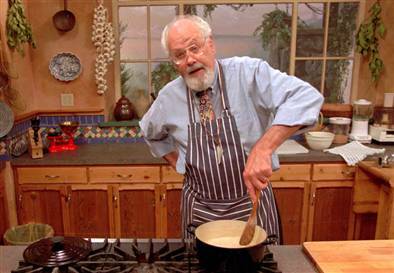 Your turn: Wh0’s your favorite TV chef?